Entries can take any form of written expression (short story, Haiku, limerick, etc.) but must include the words "Consul General" "Pig" and "Monkey." The winning entries (there may need to be more than one!) will be published in the monthly edition of Consular Corner. Please submit your entry by EOB next Thursday, March 11 to consularcorner.feedback@gmail.com. 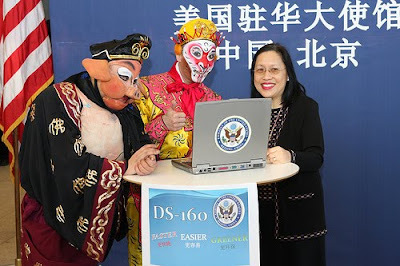 More photos here from US Embassy Beijing. H/T to Consular Corner. It's Friday, and that means that the Third Weekly State Department Blog Roundup is up - and you're on it!